The youngest child (of three) born to the Jones-Moore family. Sister to Anna Jones MacGregor. Where Maggie Jones was going to school, at least for a while. 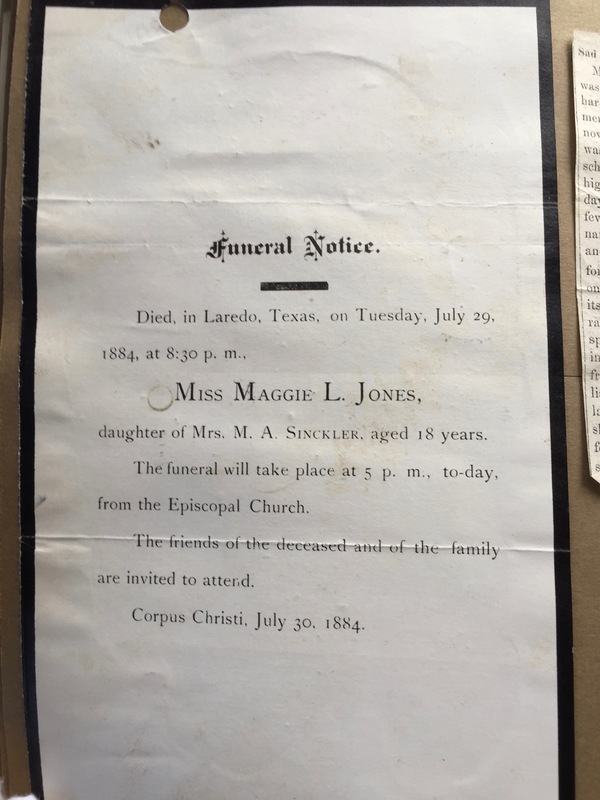 The Corpus Christi public library came through and yesterday they sent me two newspaper items on my third great-aunt Maggie Jones’s death. 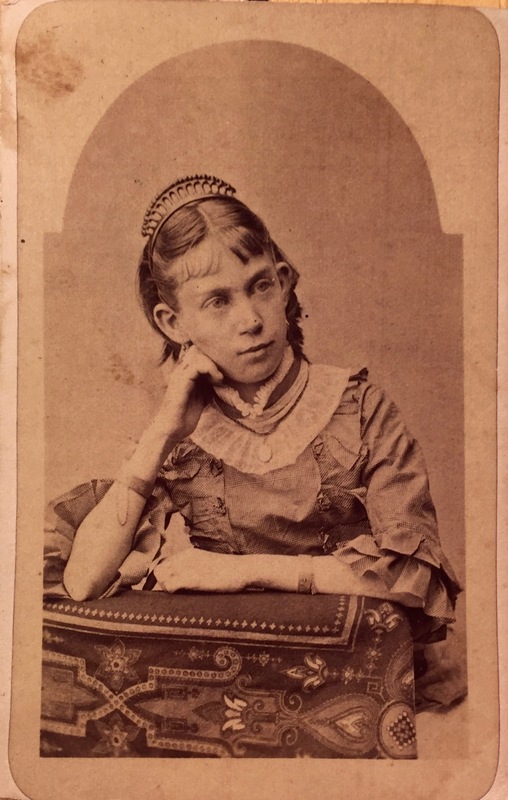 If you’ll remember, this poor kid died of scarlet fever when she was just eighteen and away from home. The story we saw last week from the Laredo paper made it sound like she’d been attending school there, and I’d thought it was the boarding school there. 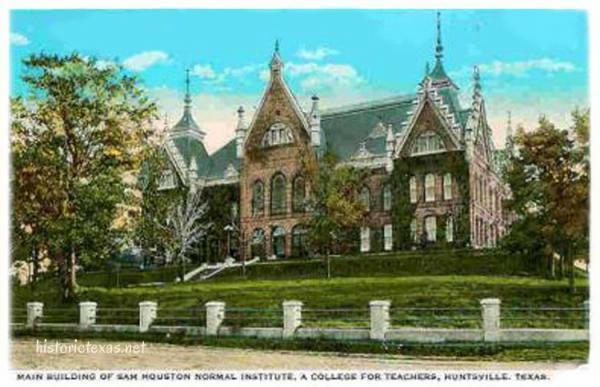 Nope, it turns out she’d been at the “Normal Institute, Huntsville,” a teaching school (now I know: normal tends to mean teacher education) that would later become Sam Houston State University. 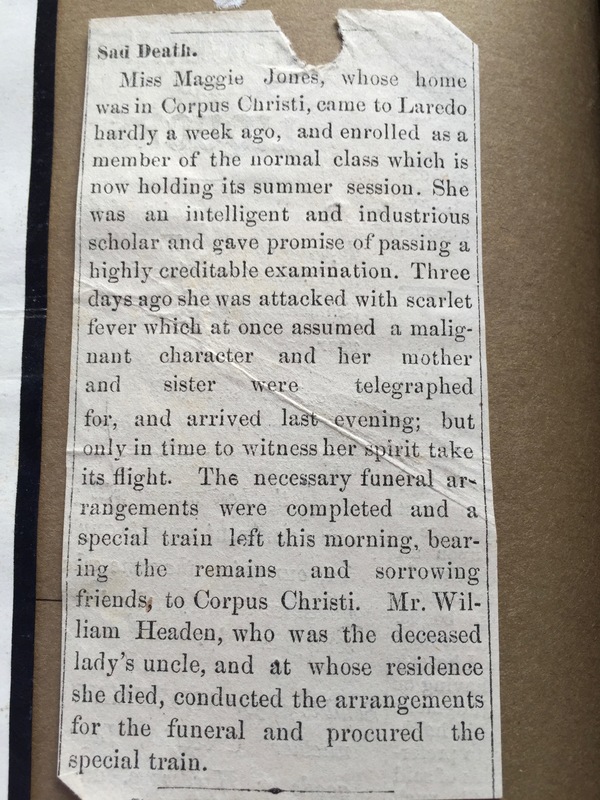 Then apparently she stopped in Laredo on her way home to stay with her aunt and uncle and take an exam at the institute there (a teaching certification exam maybe), when illness struck. 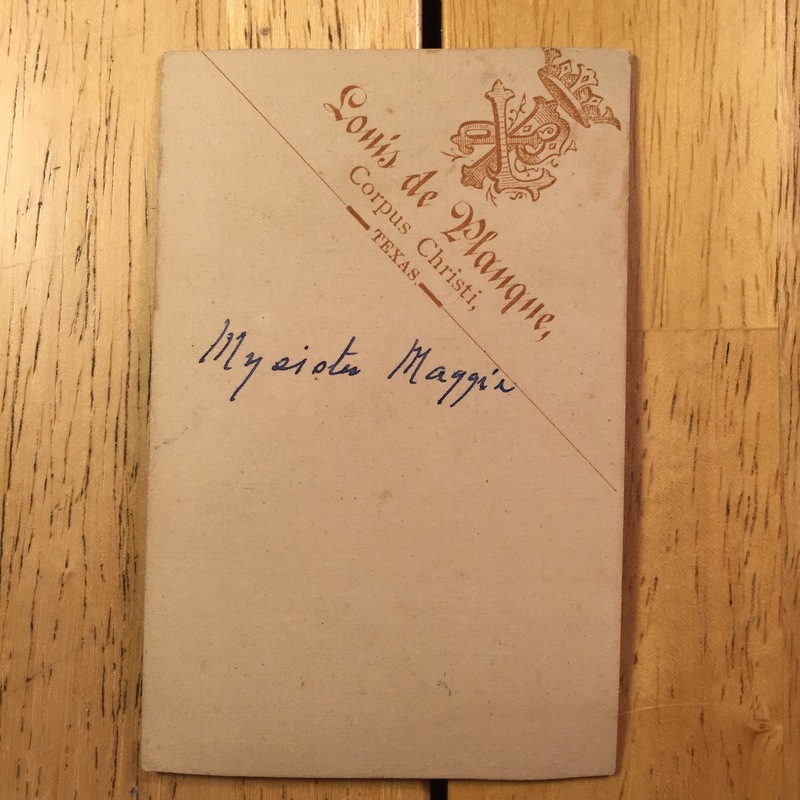 Maggie is listed as having a “probable and possible” grave at Old Bayview Cemetery in Corpus Christi, the same cemetery where her grandfather, a former mayor of Corpus Christi, would be buried a few years later. So there’s a chance she could have been buried on family property, but Old Bayview was the most likely place she would have ended up. Rest in peace, Maggie, wherever you are. I was just beginning to compose this post this morning when I realized I’d accidentally hit Publish at some point instead of Save Draft. It wasn’t a big deal, of course… I just changed it back to draft mode and it had only been online for a few minutes. By then, though, it had gone out to as a “New Post” email to the subscription list. Anyone who saw it would saw just the post title and these four images below, in the same order they appear now. Maggie was Anna Jones’s sister. According to census records, she was born around 1866 in Corpus Christi, the youngest of three—Anna, who was about four years older, followed by Harriet, aka “Hattie,” and then Maggie. I assume Maggie is short for Margaret, since she has an aunt Margaret on her mother’s side, and Hattie seems to have been similarly named-after someone on that side. I found the photo before I saw the census records. So I found out from Anna herself—well, her note—that she’d had a sister. A few months later I found out what happened to her, by way of a funeral notice in a scrapbook that Anna had put together later in life—the scrapbook appears to be from the 1920s, and there’s a single spread of pages plastered with obituaries and funeral notices of family members across the years, a sort of paper graveyard. Note: M.A. Sinckler is Mary Ann Moore, apparently widowed and remarried by 1884. And there you’ll find Maggie, who died of scarlet fever at the age of 18. A few more details: She’d died shortly after starting school in Laredo. As to which school—maybe it was the Laredo Seminary, which later became as The Holding Institute? The school seems to have served many purposes, but this marker indicates that it had opened as a boarding school for women in 1880. Anna was attending Wellesley around this time, and I think that she and Hattie later taught school in Corpus Christi, so it’s possible that Maggie was attending school to become a teacher as well… or a missionary? There were several teachers and clergy on the Jones side of the family, so either vocation seems possible. UPDATE: It turns out she was enrolled at the Normal Institute in Huntsville. Other little details to be gleaned: Maggie was staying in Laredo with her aunt Margaret on her mother’s side, who was married to William Headen. Only one sister is mentioned as arriving with their mother to be by Maggie’s bedside—maybe that was Hattie, since Anna may have been up at school in Boston. And I wonder how much it cost to have a funeral train? I found an abstract for a memorial piece published about her in the Corpus Christi Caller a week or so after her death. I hope to get the article soon. Also hope to find out where her grave is. And why she went to school. And why did she go to Laredo instead of Wellesley like her sister? And when did her father die? And what was her life like, there in another century, on the edge of Texas and the ocean?